What body parts are more susceptible to hypothermia? What are the symptoms of hypothermia in infants and children? Can a person experience hypothermia indoors? When should I call my doctor for hypothermia? What is the treatment for hypothermia? What items should I have to be prepared to prevent hypothermia? What is the prognosis for hypothermia? The body parts most susceptible to injury in patients with hypothermia are those that may suffer from poor circulation or often have the least protection from the cold environment (feet, hands, nose and ears). These extremities usually cool faster than the body's core. The internal organ most susceptible to hypothermia is the heart (dysrhythmias). The cause of hypothermia is the inability of the body's temperature regulation system to keep the body's core temperature between 35.6 C and 37.5 C (96.08 F and 99.5 F), so any body temperature below about 35.6 C (96.08 F) is considered hypothermic by many doctors. The signs and symptoms of hypothermia vary depending upon how severe the hypothermia becomes. In general, there is a sequence of symptoms that can be roughly graded as mild, moderate or severe (not all doctors agree with grading or fixed temperatures). However, the following is a list of symptoms that may occur as hypothermia progresses from mild to severe (temperatures are approximate and some symptoms may overlap). There may be some variation in these temperature values by some researchers, but these temperature levels can serve as guidelines in assessing hypothermia levels in infants and young children. Children and teens that can communicate have symptoms like those described for adults, but may occasionally have a combination of symptoms of those of a child or adult. Yes, a person can become hypothermic indoors; however, the symptoms may develop slowly or not seem as obvious to family, friends, or even health care individuals unless a core body temperature is measured. Individuals at risk for hypothermia indoors are the elderly or young living in unheated homes in cold temperatures, or living in an over-air-conditioned home. Any person that is at risk for hypothermia (see previous section on risk factors) and has had exposure to cold weather or cold water immersion, and exhibits any symptoms of hypothermia should be seen in the emergency department. Individuals exhibiting intense shivering, numbness, clumsiness, confusion and/or amnesia after exposure to cold should be seen immediately. For many people, hypothermia is diagnosed by the patient's history and physical exam; especially pertinent is the patient's core temperature. As previously stated, any core temperature below 95 F or 35 C for an adult is considered to be hypothermic (for an infant, consider 36.4 C or 97.5 F) . Most individuals with hypothermia are considered to have a medical emergency so that diagnosis and treatment begins simultaneously. Some patients can develop bradycardia and show electrocardiogram (EKG, ECG) abnormalities. For severe cases of hypothermia, treatment begins immediately in the field by careful handling of the patient to avoid developing ventricular fibrillation or any other cardiac dysrhythmia that hypothermic patients are prone to develop. Place the patient in an environment that is warm; remove all wet clothing and replace it with dry towels and blankets or sleeping bags. Simultaneously, be aware that the patient may have suffered other problems, like trauma and these problems may also need immediate attention (respiratory and/or cardiac failure). External rewarming can begin prior to hospital arrival with warm packs (warm water bottles, warm chemical packs) placed on the person's armpits, groin, and abdomen. Be sure the warm packs (about 105.8 F or 41 C) are not hot to avoid skin burns. Do not attempt to warm extremities by rubbing them. Core temperatures should be measured by a rectal, bladder, or esophageal thermometer. Do not use tympanic or skin thermometers. Hypothermic induced dysrhythmias have been treated with bretylium, but this drug may not be available as it is no longer being manufactured. After warming has begun with dry coverings, most guidelines recommend using warm humidified oxygen and heated intravenous saline (heated to about 113 F or 45 C) as additional treatments. In severe cases of hypothermia others also suggest instilling warm fluid into the patient's bladder. Thoracic lavage (flushing the thoracic [chest] region with warm water) with isotonic saline (pre-warmed to about 105.8 F or 41 C) has also been done. Patients with mild to moderate hypothermia (95 F to 89.9 F or 35 C to 32.16 C) and no other injuries or problems require less drastic methods to rewarm. Patients whose body temperature normalizes by gradually rewarming in a warm, dry room with towels and blankets, usually do not need admission to the hospital. However, those with more severe hypothermia may need to be observed in the hospital. Ideally, treatment will allow the body to return to its normal temperature. At normal temperature, the symptoms of hypothermia should gradually disappear. Consequently, the saying in most emergency departments that treat hypothermic patients is that "the hypothermic patient is not dead until they are warm and dead." The best home remedy for hypothermia is simply to avoid those conditions that result in hypothermia such as not dressing appropriately for cold weather. However, if you find someone that is possibly suffering from hypothermia the first priority is to check for breathing, a pulse and if necessary, begin cardiac resuscitation. If possible, help should be called (911). The next step is to rewarm the person as described above. If the person develops symptoms of moderate to severe hypothermia, they should be evaluated by a medical professional as soon as possible. Before participating in any cold-weather activities make sure that you are in good physical condition and have the right clothing and nutrition before engaging in such activities. If you go camping or hiking in cold weather, travel with a partner for safety and let people know where you are going. Multiple layers of clothing that are loose fitting and tend to remain dry are the best for cold-weather activities. Note that rain and wind can markedly increase the rate of heat loss from the body, so if these conditions develop, you need to be prepared to stay warm and dry. For individuals that have a higher risk for hypothermia (elderly and young children, for example), during wintry weather, keep homes heated to about 21.1 C (70 F), especially in the bedrooms at night. If the person with mild hypothermia is treated quickly, does not require hospitalization, and has little or no residual problems, the prognosis is usually very good. 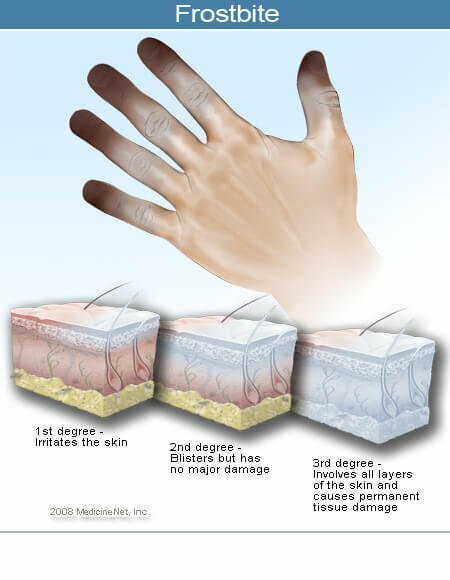 However, some patients may suffer from extremity damage due to frostbite while others may be more prone to develop hypothermia in the future. People that have concurrent problems (alcoholism, psychiatric problems, advanced age or are homeless) have a worse prognosis, and their mortality rate is higher. NYU Department of Pediatrics. Hypothermia. UpToDate. Clinical manifestations of hypothermia in children.